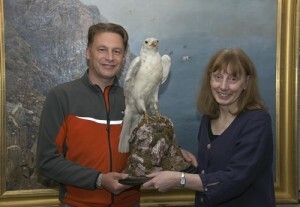 Chris Packham, the popular TV naturalist and Curator Sharon Cross holding a Greenland Gyr-falcon, one of the exhibits in the George Lodge exhibition. On Saturday 20th February, Surrey Heath Museum was delighted to welcome a special visitor, when popular wildlife broadcaster Chris Packham came in to see the current exhibition, which highlights the life of George Lodge, a remarkable artist who spent his last 34 years in Camberley. A wildlife artist of national repute, Lodge was most famous for his paintings of birds, particularly hawks and falcons. His work took him all over the world but his most notable achievement was the illustration of all 12 volumes of Bannerman’s The Birds of the British Isles, a job he completed between the ages of 82 and 91. The exhibition is a collaboration between the newly formed George Edward Lodge Trust, the Tryon Gallery in London and the Museum itself. Lodge’s work is now much sought after and visitors have come from as far afield as Norfolk and the Midlands to see the show. Chris is an admirer of Lodge’s paintings of hawks and was a keen falconer himself as a boy, so spent over an hour with the Museum, before going on to give a fascinating talk at Camberley Theatre.